Hello everyone. Currently writing to you from my Air BnB couch in Copenhagen! Ashley and I arrived early this morning from Milan, and I thought I’d share some of my recent outfits and whereabouts during my stay. I get tons of questions regarding where to stay, have coffee, food, etc. So I thought I’d break it down for ya here on a post. 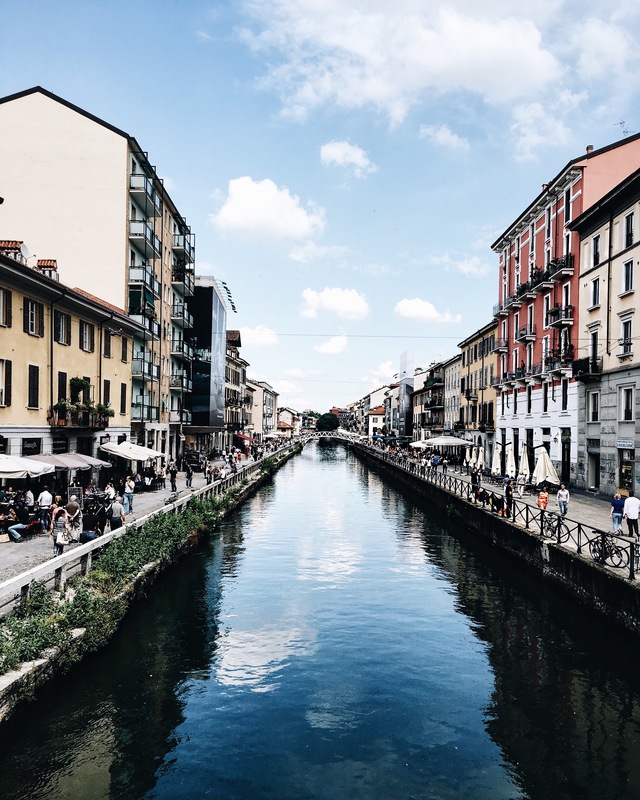 The canals at Navigli- grab some gelato and walk the cobblestone streets under the sun! There are restaurants a plenty with cool modern café’s nestled in between. Canali OOTD details before the fashion show. Mag Café – great place to chill along the canals with your girl. It’s “so cute!” Guarantee she’ll love it, and you guys can enjoy some yummy shakeratos! Tons of retro cars around town. You have to stop and snap some pics. Visited Deus Café in Isola- the up and coming hipster-esque side of Milan. We really enjoyed this area and highly recommend spending an afternoon in and around this café. You’ll be sure to spot tons of trendy, young, fashionable friends. His & Hers Outfit Deets: (her) Acne Studios dress and shoes, (His) Full Canali look. Interiors at Deus Ex Machina in Isola, Milan. Photo taken by our friend Zach of Brothers & Craft in Garibaldi, Milan. We were off to dinner at Dry (highly recommend) and then some good ol’ Birra Moretti! Wandering the streets of trendy and artsy Brera! My full look post Canali show. Guess who took this pic? Literally all over the city! Snapped this photo of Ash as we were wandering through the canals. Lighting was perfect and that brick wall exuded character and charm. DUOMO! A definite must-see in the city center. The Duomo is an incredible work of art and the architecture is astounding! Rainy Day OOTD: Suit Supply hat, J.Crew vest, Apolis shirt, Ted Baker denim, and Crosby Square ‘Stevens’. We carried our cameras and external chargers in my Jack Spade tote.